1952 the first Elsatolin figures was standing in the Showcases. The Modelers of the Hausser company presented a lot of interesting models until the end of the company end of the company was coming in the year 1983. Figure groups of the Romans, Vikings, and other medieval topics, land farmhands and Turks, Indians and Cowboys, Africans, mercenaries and soldiers of the 10th, 18th and 20th century as well as a multiplicity at civil figures was offered for the customer. Heroes and persons from the American comic “Prince Vailand” and the famous novels written by Karl May were always popular figures. During the thirty years of production there were changes in paint technique and colors. Many figures was painted with different colors and color combinations. 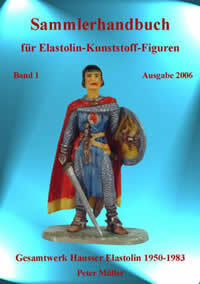 The new Manual from Peter Müller for Elastolin-plastik-figures is available now.